Demba Ba has scored 16 goals in 20 matches with Besiktas this season. 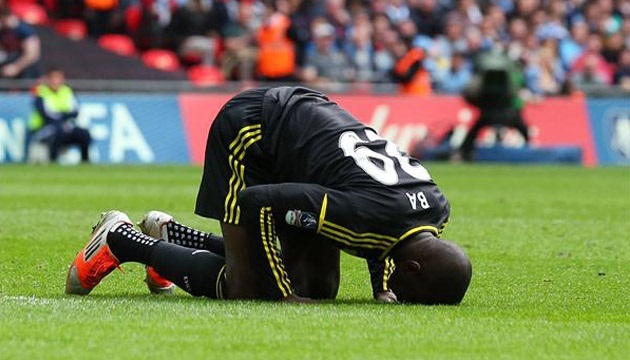 Demba Ba is, in at least one way, the Tim Tebow of Muslim athletes. Demba Ba became a household name among international soccer fans while playing for Newcastle United and Chelsea in England’s Premier League. The Senegalese striker currently plays for Besiktas in Turkey’s Super Lig, where he remains one of the sport’s most prolific goal-scorers. Ba celebrates each goal by performing sajdah — a prostration in worship to Allah (swt) that is performed several times per day by more than a billion Muslims around the world during prayer. It has become such a signature for Ba that in the globally popular EA Sports FIFA video-game series, Ba’s digital likeness does the sajdah after gamers score a goal with him. The tradition of the Muslim footballer to prostate himself in the direction of the goal has become a hot debate among the scholars who are arguing about whether his prostration is in line with the rules of Islam. The prostration, which major world religions employ as an act of submissiveness or worship to a supreme being or other worshiped entities, is called secdah in Islam, and some scholars argue it is only permitted to be applied in address to Allah, and in the direction of the Qiblah. A prominent Islamic scholar, Ahmet Mahmut Ünlü, responding to a question about whether it was right, in accordance with the principles of Islam, for Demba Ba to prostrate himself after each goal during the matches in Super League, said “It is a risky and dangerous thing to do” and suggested that the footballer was ‘unintentionally’ committing sin. However, other Islamic scholars have argued that it is a means of expressing gratitude to God and have no qualms with its permissibility under Islamic laws. Turkey’s Daily News has an article on the sajdah debate that goes into more detail of the arguments on each side. Ba is not the only Muslim athlete who has prostrated during competition or on the field of play. Olympic gold medalist distance runner Mo Farah often prostrates on the track after his races, typically in whatever direction he was facing while running. Husain Abdullah, a defensive back with the NFL’s Kansas City Chiefs, prostrated in the end zone after scoring a touchdown against the New England Patriots on “Monday Night Football” in September of 2014, an act which drew a penalty flag for unsportsmanlike conduct. (The NFL admitted the next morning that Abdullah should not have been penalized, since prayer and religious gestures on the field are permitted.) Abdullah, like Farah, didn’t appear to make a point to face the Qiblah; he simply prostrated in the same direction he’d been running. Other international soccer players like Papiss Cisse, Seydou Keita and Mohamed Salah, to name a few, have been known to prostrate after scoring a goal. For most of these athletes, their actions have been received favorably by the Muslim community. Any breach in conduct they may be committing by not facing the Qiblah is apparently forgiven by the fact that they are bringing positive attention to Islam by acknowledging the Most High and declaring their faith on some of the world’s biggest stages.